Baby monitors, they’re not all created equally and yes, some are better than others. 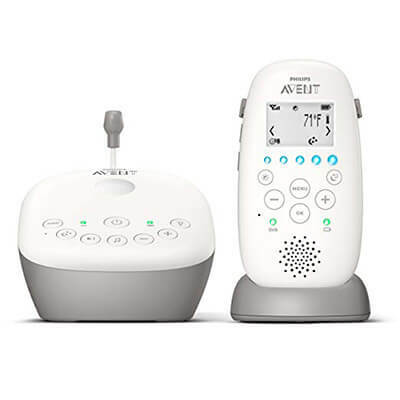 If you’re in the market for a baby monitor, one brand to check out is those made by Phillips AVENT. This manufacturer actually has quite a few different options to choose from. 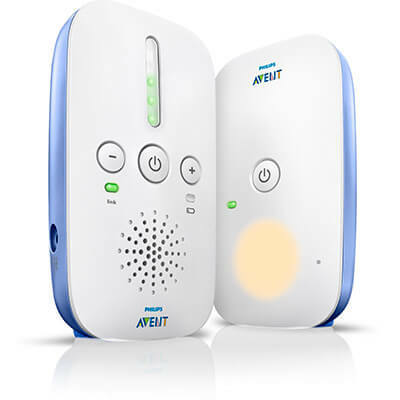 To see if any of them are what you’re searching for, keep on reading because this article is going to focus on and offer an in-depth review of each one of the Phillips AVENT Baby Monitors that are currently available. If you’re looking for a simple, easy to use a baby monitor, then this selection is perfect for you. It has easy to operate push buttons, 5 LEDs that signal sound, and a range of up to 330 meters. That it has a sleek, lightweight design. Technology that actually guarantees zero interference. A range up to 330 meters. That it’s parent unit can be run using outlet power or AA batteries. A Smart ECO mode that makes effective use of energy. Technology that guarantees zero interference from outside sources and 100% privacy. A range of up to 330 meters. Night mode with a light and lullabies. LEDs, low battery indicator, and a rechargeable parent unit. A base and a parent unit that has a super sleek design. Very, very easy to operate while being extremely mobile. Has crystal clear sound, just like the other monitors made by Philips AVENT. Experiences zero interference, courtesy of state of the art DECT technology. Can be powered via an AC plug adapter or rechargeable batteries. Has LEDs for sound sensitivity, out of range, and low battery alerts. Has over 100 frequency channels. The ability to play calming lullabies. Has a nightlight to soothe a baby. There is a talkback, two-way communication features. Features an eco mode to reduce energy consumption at short ranges. Has LED indicator lights for sound, out of range, and low battery. Comes equipped with a nightlight and the ability to play soothing songs. Uses less power at shorter ranges to conserve energy. Can be powered by electricity through an outlet or batteries. Being able to monitor more than just your little one’s sound level is just one of the thing’s this Philip’s unit provides since it also lets you check the temperature of your son or daughter’s room, ensuring that it doesn’t get too hot or too cold. 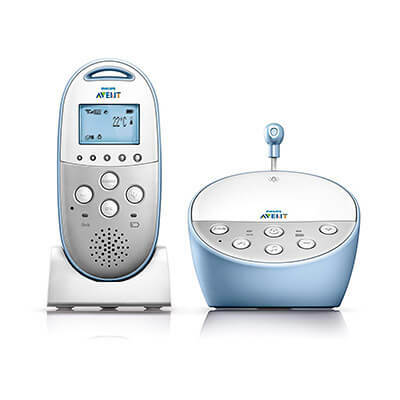 The Philips AVENT well-know DECT technology that guarantees a connection that is crystal clear. A unique color scheme of orange and white that makes it easy to find in a hurry. It’s small, cordless and synch to transport. Comes with a temperature monitor. Has a night light, plays five different lullabies, and comes with visible light indicators. Digital DECT technology combined with a slim design and sturdy electronic components is why this monitor is a solid choice. It gives you piece of mind that your child is okay due to the fact that you can keep track of what he or she might be doing in his or her room. That it’s lightweight, portable, and very mobile thanks to its slim parent unit. Sound that is tremendously clear. Comes with room temperature sensor. Offers a secure connection with 100 channels. Infrared night vision, which turns on automatically in the dark. Has a screen that is self-activating when your infant cries. 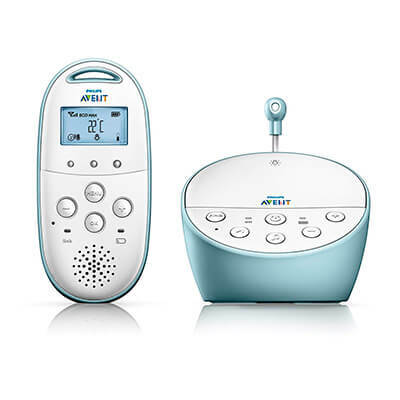 Clear sound that also lets you hear your baby. Sound level lights, a battery level indicator, and a battery charging indicator. A connection that is 100% private with automatic channel selection. A range of 30 meters indoors and an outdoor range of up to 150 meters. The parent unit is rechargeable; baby unit has a battery backup in case of power outages and can be mounted on a wall. Now that you know about what Philips AVENT Baby monitors are available, you’re probably wondering what people actually had to say about them. Instead of going online to see what people had to see, we’re going to make things easy for you. How? 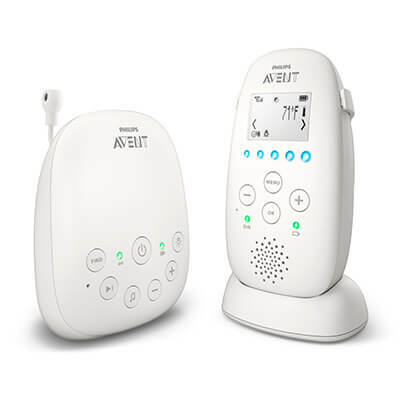 Well, we decided to check out different reviews on the models offered by Philips AVENT and compiled a list of the opinions we found. Parents commented about how the baby monitors were very clear and liked how other electronics didn’t interfere with their monitor’s signal. Moms and dads also like how a most of the monitors offered DECT technology that guaranteed 100% zero interference from outside choices, so, they didn’t have to worry about bad signals or their privacy being violated. Another thing parents liked was how most of the monitors came with nightlights and the capability of playing lullabies, which helped soothe their children without them having to do anything. Being able to keep track of the temperatures in their babies rooms was yet another feature that parents found to be very useful, especially those parents who lived in climates that had rapidly changing weather patterns. A lot of parents noted that the option to power the units that weren’t rechargeable using either an AC plug via a power outlet or batteries was very convenient and something that wasn’t available with other monitors that they came across. Some parents didn’t like the price points of the baby monitors from Philips AVENT and found them to be somewhat expensive compared to other monitors. There were a few moms and dads who noted that some of the rechargeable units didn’t keep a charge as long as they would have liked. A few parents pointed out that some of the monitoring bases weren’t as slim and sleek as described on different websites, making it difficult to place in their child’s bedroom. However, they did like how most of the parent handheld units came with belt clips. 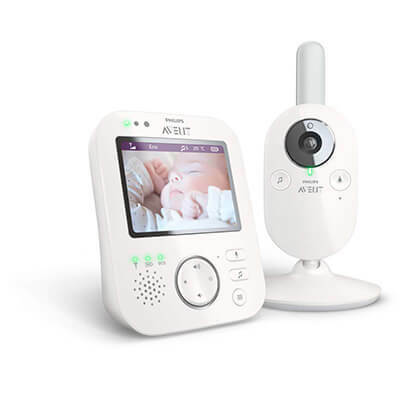 At the end of the day, baby monitors from Philips AVENT offer you a dependable way to monitor the activities of your little one. And, the most convenient way to purchase one is by shopping online due to the fact that you can do it right in the comfort of your own home. Basically, you order, it’s shipped to you, and that’s it. So don’t waste any time and get that baby monitor ordered so you can have it in place and ready to go by the time your baby arrives.